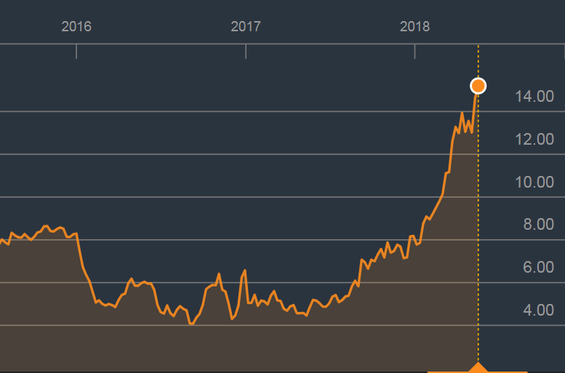 The upward trend in CO₂ prices has been clearly visible since early 2018. In mid-May 2018 the prices of CO₂ emissions rose to EUR 15 per tonne. This is favourable for Circular Energy as we don't need to buy emission rights. For a new power plant, the owner must purchase emission allowances for the amount of CO₂ emitted by the plant. This is (almost) zero for Circular Energy because our power station captures and stores the CO₂ immediately. A gas-fired plant without carbon capture costs € 6.60 in CO₂ emission costs per MWh produced. For a coal-fired plant, that is roughly double. The higher costs are calculated in the price the power station has to charge for the electricity and therefore in the market prices. That is the same market at which Circular Energy sells its energy. We therefore benefit from higher CO₂ prices through a higher market price.